Definition at line 29 of file LogPager.php. int $logId Log entry ID, to limit to a single log entry. Definition at line 71 of file LogPager.php. References DB_REPLICA, ReverseChronologicalPager\getDateCond(), limitAction(), limitLogId(), limitPerformer(), limitTitle(), limitType(), and wfGetDB(). Definition at line 439 of file LogPager.php. Definition at line 449 of file LogPager.php. References $user, LogPage\DELETED_ACTION, ContextSource\getUser(), LogPage\SUPPRESSED_ACTION, and LogPage\SUPPRESSED_USER. Definition at line 466 of file LogPager.php. References $user, LogPage\DELETED_USER, ContextSource\getUser(), LogPage\SUPPRESSED_ACTION, and LogPage\SUPPRESSED_USER. Definition at line 388 of file LogPager.php. Definition at line 435 of file LogPager.php. Definition at line 427 of file LogPager.php. Definition at line 91 of file LogPager.php. 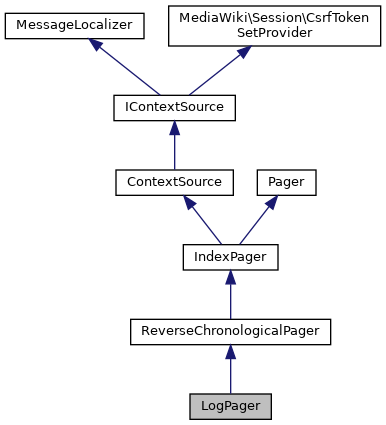 References ReverseChronologicalPager\$mDay, ReverseChronologicalPager\$mMonth, ReverseChronologicalPager\$mYear, $performer, $query, and $typeCGI. Definition at line 103 of file LogPager.php. References $type, $wgFilterLogTypes, as, ContextSource\getRequest(), and null. Definition at line 364 of file LogPager.php. Definition at line 423 of file LogPager.php. Definition at line 408 of file LogPager.php. Definition at line 415 of file LogPager.php. Guaranteed to either return a valid title string or a Zero-Length String. Definition at line 401 of file LogPager.php. Constructs the most part of the query. Extra conditions are sprinkled in all over this class. Definition at line 310 of file LogPager.php. References $options, $tables, DatabaseLogEntry\getSelectQueryData(), hasEqualsClause(), and ChangeTags\modifyDisplayQuery(). Definition at line 368 of file LogPager.php. References $title, LinkBatch\add(), as, IndexPager\getNumRows(), Title\makeTitleSafe(), LogFormatter\newFromRow(), NS_USER, and NS_USER_TALK. Definition at line 431 of file LogPager.php. Definition at line 392 of file LogPager.php. Definition at line 419 of file LogPager.php. Checks if $this->mConds has $field matched to a single value. Definition at line 357 of file LogPager.php. Definition at line 274 of file LogPager.php. References $action, $type, $typeCGI, and $wgActionFilteredLogs. Limit to the (single) specified log ID. int $logId The log entry ID. Definition at line 298 of file LogPager.php. Set the log reader to return only entries by the given user. Definition at line 181 of file LogPager.php. References $name, DB_REPLICA, enforcePerformerRestrictions(), Title\makeTitleSafe(), User\newFromName(), ActorMigration\newMigration(), NS_USER, and wfGetDB(). Set the log reader to return only entries affecting the given page. Definition at line 211 of file LogPager.php. References IndexPager\$mDb, $name, $params, $pattern, $wgMiserMode, $wgUserrightsInterwikiDelimiter, as, enforceActionRestrictions(), Title\getDBkey(), Title\getNamespace(), Title\getPrefixedText(), list, Title\newFromText(), and title. Set the log reader to return only entries of the given type. Definition at line 137 of file LogPager.php. References $type, $types, $user, $wgLogRestrictions, array(), as, LogEventsList\getExcludeClause(), and ContextSource\getUser(). Definition at line 46 of file LogPager.php. Referenced by getAction(), and limitAction(). Definition at line 52 of file LogPager.php. Definition at line 55 of file LogPager.php. Definition at line 40 of file LogPager.php. Referenced by getPattern(), and limitTitle(). Events limited to those by performer when set. Definition at line 34 of file LogPager.php. Referenced by getDefaultQuery(), and getPerformer(). Definition at line 49 of file LogPager.php. Events limited to those about Title when set. Definition at line 37 of file LogPager.php. Referenced by getPage(), and getStartBody(). Definition at line 43 of file LogPager.php. Referenced by getDefaultQuery(), and limitAction(). Definition at line 31 of file LogPager.php. Referenced by getType(), and limitType().